The Chowrasta Mall in Darjeeling not only offers a wonderful meeting square where you can relax and watch the views and activities, it also offers an excellent opportunity for shopping. There are many glittering shops that circle the Mall. Some of these were established during the British India days and have created distinctive brands for themselves today. As you approach the Mall from Nehru Road and after having crossed over the Pine Ridge Hotel, you will see a bunch of great shops in the Mall. 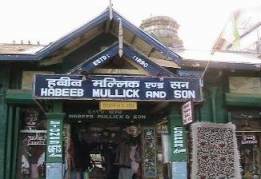 One of them is the Habeeb Mullick & Son that has two sections with two separate entrances and run by the two Mullick brothers. This is the oldest store in the hill town selling exquisite silver jewelry, curios, models, shawls and lot of other items. Check out the link to know about what one of the Mullick brothers shared with me and the special offerings of the store. The next store in the Mall is my another favorite, the Oxford Book Store. This book store is special. Here you will get books and maps of Darjeeling and Himalayan areas which you won't get anywhere else. 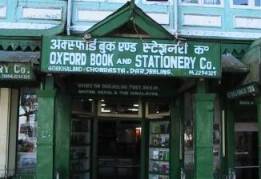 Every time I visit Darjeeling, I pick up a book from here that adds to my Darjeeling collections. Another store on this side of the Mall is called Chowrasta Store and is a favorite for the liquor and wine lovers. It's well stocked with both Indian and imported liquor and wine. It has recently changed its board outside. The board earlier had an ad of wine to which the state government had raised objection. It has now been redone with name of the store written in bold Nepali letters as well as in English. If you like to taste some great Darjeeling tea, try it out at the Nathmulls Tea & Sunset Lounge. The front part of the store is a Nathmulls tea outlet. Nathmulls is one of the oldest and largest tea merchants in Darjeeling operating since 1931. They collect tea from tea auctions as well as from various tea estates directly. Here at the outlet you will get flavored Darjeeling tea of different varieties in packets. Another place to try out some great Darjeeling Tea is at Golden Tips, which is located in the same line as Nathmulls and on its left. This is a nice large tea lounge having great views of the valley at the end and serving some nice snacks as well. 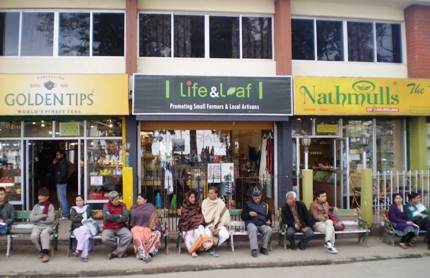 Life & Leaf is a wonderful boutique store located in between Golden Tips and Nathmullls. They sell many different gift & souvenir items including mugs, tea sets, jute bags etc made by local artisans. They also have fair trade organic tea and honey produced by the local farmers. A great shop to visit. Update 2016: Nathmulls outlet has moved to another location on the Mall. Inside there is a section that sells different kinds of souvenir and gift items. You will get jute bags, brass makes of small elephants, porcelain items like small cups & plates, jewelry boxes, wood carved items like small fishes, metallic hukkas and more. They of course sell Darjeeling Tea in packets of various sizes as well. On the right side of Nathmulls and the last store before the Mall road begins is Tibet Arts. It's a small store selling all types of curios. They also sell Pashminas (special fine woolen items) and shawls, models and other crafts. On the other side of the Mall where the Zakir Hussain Road enters the Mall area, there is a cluster of shops. One of the prominent ones is Jolly Arts, that offers different kinds of crafts, floor & wall carpets, jewelry boxes and other curio products. 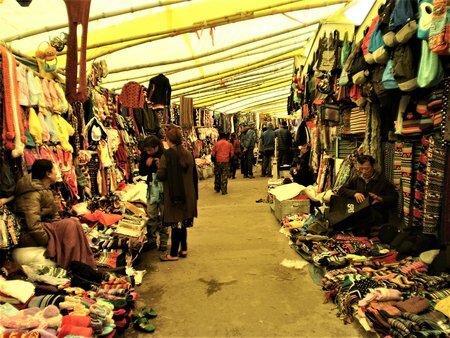 They also have great collections of Tibetan masks some of which show vivid facial expressions, stones, artwork on clothes, jewelry items, fine woolen shawls and many other souvenir and gift items. They are one of the most reputed stores in the mall. The store is owned by Mr. Altaf Fazili. His son Washim is also present at the store most times. On its right is the Chowrasta Tea Stores. This store is owned by the owner of Jolly Arts. You can have a cup of tea here. They sell both packaged and loose tea. The next store is Arts Crafts & Curios. They have a nice collection of Tibetan masks as well. They also sell Khukris (Gorkha curved decorative knives), different models made of oxidized metals, models of Lord Ganesha, key rings, different types of stones etc. There are few more stores here. Curio Corner is government registered and sells Tibetan jewelry, carpets and curios. Next to it is the Darjeeling Tea Corner where you can buy packaged Darjeeling Tea. And then Bhutan Tibet Art Shop selling Tibetan artwork and crafts. Bhutia Market, also known as New Mahakal Market (do not confuse this with the Mahakal Market at Chowk Bazaar area). 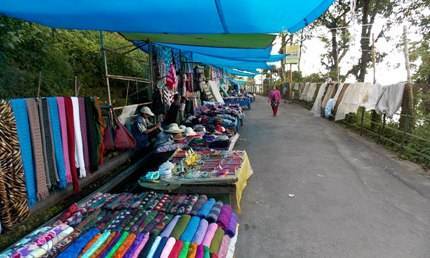 This market is a row of temporary stalls set up by local Bhutias and located on a narrow lane that leads down from the Mall and passing by Hotel Sunflower. This is where you will get lots of woollens (like sweaters, gloves, woollen caps, mufflers etc), jackets, umbrellas and even jeans at very reasonable prices. Few years back you could see these temporary Bhuitia stalls lined up along both sides of Nehru Road and seriously eating into the business of the proper stores there. They had to eventually move out. While most have found their new home here, some had to move to Mall road (east) as there was no space left in this place. Note: Most of the stores in Darjeeling (except the stalls at Bhutia Market) accept Master and Visa cards. Some also accept BoB and American Express.